NEW YORK (AP) — Scientists have gained new insights into an extinct South African creature with an intriguing mix of human and apelike traits, and apparently an unusual way of walking. But they still haven't pinned down where it fits on our evolutionary family tree. It will take more fossil discoveries to sort that out. The human branch of the evolutionary tree, called Homo, is thought to have arisen from a group of ancient species called australopithecines. 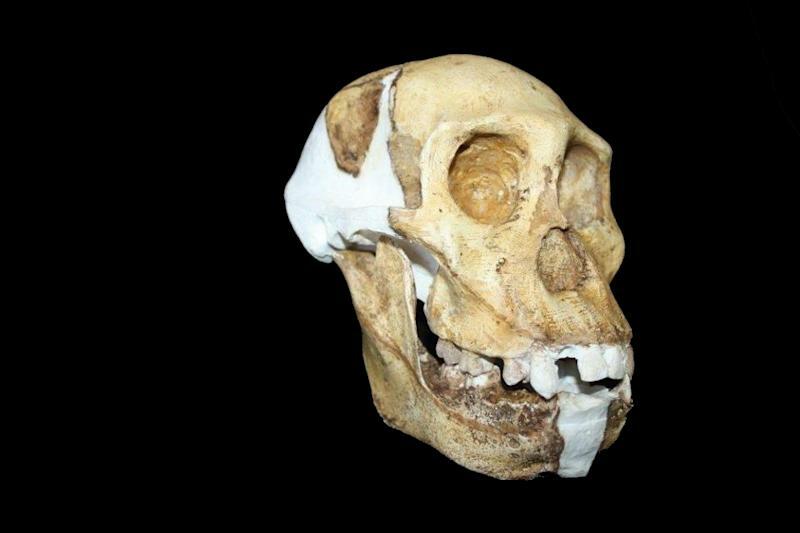 The newly studied species is a member of this group, and so its similarities to humans are enticing for tackling the riddle of how Homo appeared. 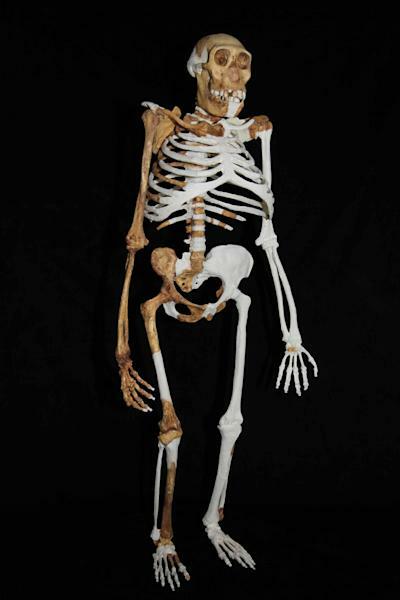 It's called Australopithecus sediba (aw-STRAL-oh-PITH-uh-kus se-DEE-bah), which means "southern ape, wellspring." It lived some 2 million years ago, and it both climbed in trees and walked upright. Its remains were discovered in 2008 when the 9-year-old son of a paleoanthropologist accidently came across a bone in South Africa. A 2011 analysis of some of A. sediba's bones showed a combination of human and more apelike traits, like a snapshot of evolution in action. That theme continues in six papers published online Thursday by the journal Science, which complete the initial examination of two partial skeletons and an isolated shinbone. Jeremy DeSilva of Boston University, lead author of one of the papers, said the fossils reveal an unexpected "mosaic of anatomies." "I didn't think you could have this combination, that hand with that pelvis with that foot... And yet, there it is," he said. DeSilva said he has no idea how A. sediba is related to humans, noting that the different traits argue for different conclusions. 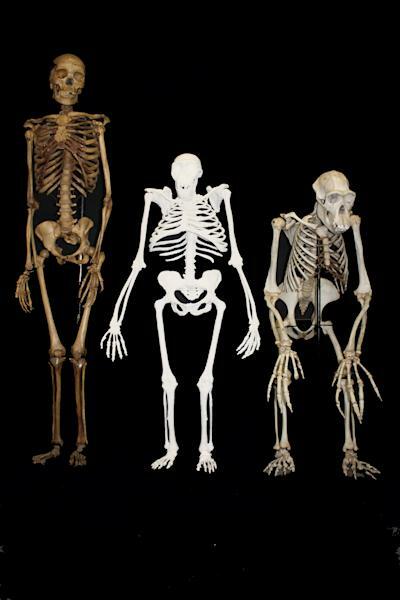 Among the new analyses, the ribs show the creature's upper trunk resembled an ape's, while the lower part looked more like a human's. Arm bones other than the hand and wrist look primitive, reflecting climbing ability, while earlier analysis of the hand had shown mixed traits. The teeth also show a mix of human and primitive features, and provide new evidence that A. sediba is closely related to early humans, said Debbie Guatelli-Steinberg of Ohio State University, a co-author of a dental analysis. It and an older South African species, A. africanus, appear more closely related to early humans than other australopithecines like the famous "Lucy" are, she said. But she said the analysis can't determine which of the two species is the closer relative, nor whether A. sediba is a direct ancestor of humans. Another study found a mix of human and apelike traits in leg bones, and concluded that A. sediba walked like no other known animal. Its heel was narrow like an ape's, which would seem to prevent walking upright, but the more humanlike knee, pelvis and hip show A. sediba did just that, DeSilva said. When people walk, they strike the ground with the heel first. But that would be disastrous from A. sediba's narrow heel bone, so instead the creature struck the ground first with the outside of the foot, DeSilva and co-authors propose. The foot would react by rolling inward, which is called pronation. In people, chronic pronation can cause pain in the foot, knees, hip and back, said DeSilva, who tried out the ancient creature's gait. "I've been walking around campus this way, and it hurts," he said. But the bones of A. sediba show features that evidently prevented those pain problems, he said. The creature apparently adopted this gait as a kind of compromise for a body that had to climb trees proficiently as well as walk upright, he said.